Today Chris and I had our meeting with our wedding planner, Natalie and her assistant. 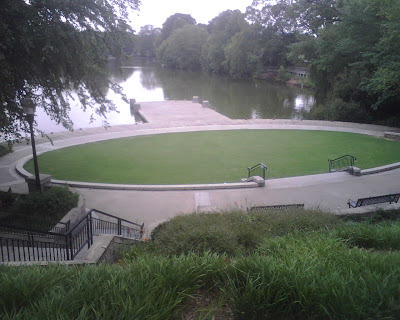 Since we are having our wedding at park in Atlanta, there's not a designated person who will keep everyone organized, so we hired Natalie of Georgia Wedding Directors to direct our ceremony. We learned a lot today and realized how many more decisions we have to make!! I think some of our hardest decisions will be choosing songs for the processional for each family member, etc. A good tip the wedding planner told us to do was to bring our marriage license with us to the rehearsal to give to our pastor......that way, its one less thing to worry about on the day of the wedding!! And then she brought up the dreaded question "What if it rains?" Of course we have a tent on reserve just in case, but we are praying we don't have to use it!! Chris had his bachelor party a few weeks ago, but mine won't be until July 6th! I am so excited! One of my bridesmaids, Bonnie is throwing it.....I'm not sure what she has instore for us girls, but I hope she watches Bridezillas this Sunday on We! Kaileema's bridesmaids throw her an awesome surprise bachelorette party! I won't spoil the surprise, but I think having one of these at my bachelorette party would be a blast!! Last weekend my sisters (my maid and matron of honor) threw a bridal shower for me. They made it a Feng Shui shower and gave everyone little red chinese take-out boxes with little goodies in them! My cake was chocolate with vanilla icing and it had the chinese symbol for "happiness" on it! They served sushi, fried rice, edemame, and sake! It was so much fun! Next weekend.....I'm having my lingerie shower!! I can't wait!! Coming up with a wedding "theme" isn't necessary, but it sure does make the wedding planning more fun! My fiance, Chris and I decided that we wanted to stick with a theme of "bright colors." Our bridemaids and groomsmen are wearing different color dresses and ties....a rainbow of fuschia, pink, peach, yellow, green, blue and lavender! Even our cake will be bright colors!! As I was watching the exclusive preview of Bridezillas Episode 2, I really liked one of the "Zilla's theme......she decided to do a Tiffany & Co theme! Everything from her cake to her bridesmaid dresses are Tiffany blue! And for wedding favors, she does something so cute, I wish I had thought of it!! For our wedding favors, Chris and I have rented a photobooth that guests will be able to go in and take unlimited photos! I think it will be a hit! Plus, we're setting out a table for guests to sign and leave copies of the pics for us! My favorite show is BACK! Thanks to WE tv, I've been given exclusive previews of this season and I have to say.....its going to be a good one!!!! I love watching it and getting ideas for my own wedding....like how to wear my hair, decorations, etc. Oh yeah, and how NOT to treat my bridesmaids!!! I think I've decided that I'm going to get my bridesmaids these adorable MadieDeluxe (www.madiedeluxe.com) bags as bridesmaid gifts! I'll be using the JaJa clutch in True White to carry a few things on my wedding day and when I showed a few of the girls, they absolutely loved it!! I'm going to get Mande, the pregnant bridesmaid the Mommy Tote! I think I'll get the other bridemaids a different tote and fill each one up with some goodies!! As I mentioned yesterday, I mailed out our invitations last week. 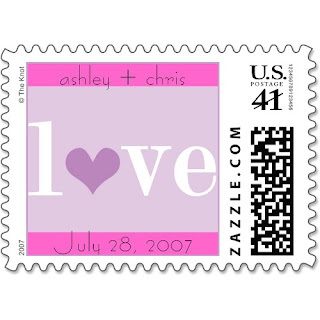 Because they were so heavy, we had to put one $0.41 cent stamp and one $0.26 cent stamp on the envelope. 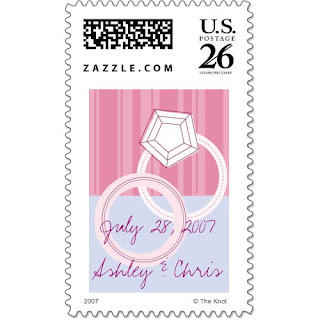 With the rate change, I couldn't find the cute LOVE stamps we used for our Save the Dates, so I went to Zazzle.com and personalized our own stamps! I used the ones created ny The Knot, but you can even put your photograph on them! I think I'll use one of our wedding photos and make stamps for our Thank You cards!!! Address invitations and send them out DONE!! Mailed them out last week! 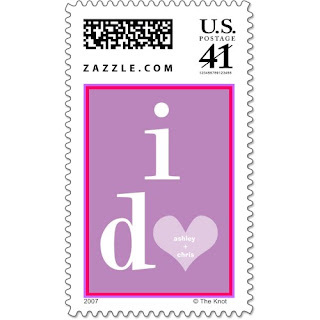 Later tonight I'll post a pic of them...and our personalized stamps!!! Check on vendor’s progress and confirm arrangements with each one. In progress! Last week we had our caterer dinner tasting!! Select gifts for each other, attendants, parents and other helpers. Still haven't decided on a girft for Chris....I think we're sending my parents to a bed & breakfast for a weekend get-away as their gift!! And I'm not sure what I'm getting my bridesmaids and other helpers!! Chris is getting his groomsmen personalized bar signs....a really unique idea!! Order and/or pick up rings and make sure they fit. We've ordered the rings, but haven't picked them up yet! Finalize Ceremony Details. We're finishing that THIS week!!! Stay on top of thank you notes. I've been great about our Thank You's...I try to respond with in 2 days of receiving a gift! Confirm transportation arrangements and honeymoon plans. Honeymoon is set! We're going to Costa Rica!!! Start work on favors if you or the wedding parties are making them. We're renting a Photobooth as our wedding favors! So fun!! I haven't had crazy dreams like this since the first month I got engaged, but now that I'm less than 2 months away from my Big Day....they've started again! Last night, I dreamt that I showed up to my rehearsal dinner in my wedding dress!! And once I got there, I realized that I needed to change before everyone saw me in my dress---especially Chris!! In the dream, I remembered that I hadn't bought Chris his gift and card and I felt awful! Plus, the caterer came to tell me that I only paid for 150 guests and 200 were there!! I was so relieved when I woke up!!! #1 I don't know what I'm getting my groom yet! Ideas, anyone? #2 We're getting ready to send out our invites so our guest count is still in question! #3 Tonight we are having our tasting for our wedding dinner! We're having chicken breast stuffed with mushrooms, cheese and spinach. Our sides are garlic mashed potatoes and a vegetable medley. Yum! I guess to avoid these dreams I'm going to have to stay on top of my checklist!